Dhingana music website has launched gadgets for Gmail and iGoogle for super easy access to top hindi songs. Gmail addicts can get daily fill of their popular Indian music with a glace at the left sidebar. You can click through more link and see host of other options to manage your favorite music. It shows details of top songs, public playlist of celebrities and your customized music playlist. To get started, Gmail users need to click Settings > Labs. Then scroll down and look for option “Add gadget by URL”, highlight enable and click save changes button. Now you will see new tab “Gadgets” under settings. Click gadgets and enter http://www.dhingana.com/gmail to see Dhingana music box appear on left sidebar. You can click more button on Dhingana box to see host of other options. iGoogle users can get similar functionality. Goto Dhingana iGoogle gadget webpage and add it to your iGoogle page to browse latest music. Thess gadgets only allow you to see top music listing and maintain personal playlist. Any click to listen songs will open the music player in new webpage of Dhingana website (of course). 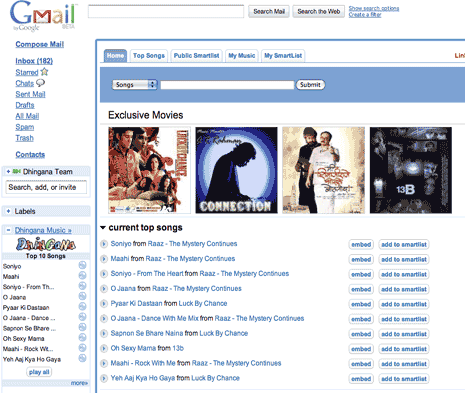 Checkout Dhingana Gmail and iGoogle way to surf music – neat and without too much fuss, let the music begin!